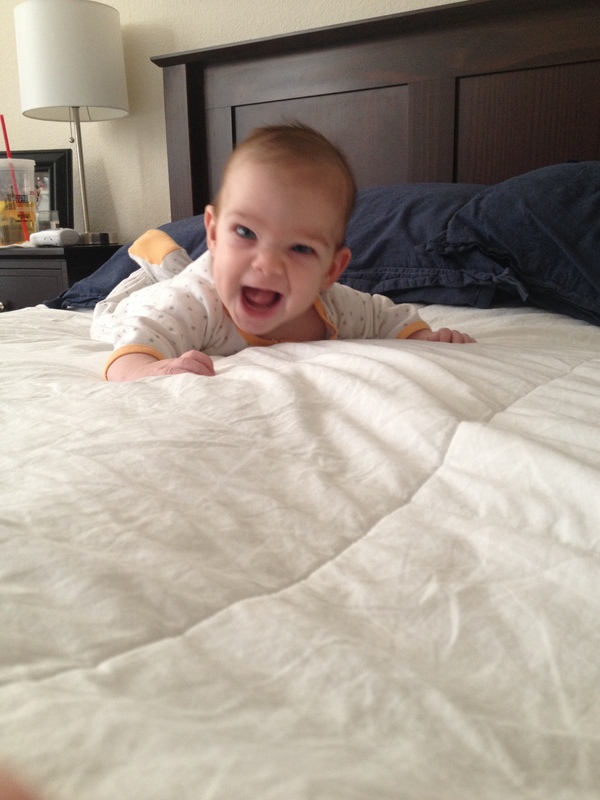 My youngest daughter, Lucy, is an active, exploring four month-old. We love this stage, where you can see on her little face her focus and concentration as she learns about the world around her. I also love this stage because she is showing signs of attachment to me as her mom. She will be looking around, checking out her surroundings, and something loud will startle her or scare her. If I am in the room, she will turn to me and stare into my eyes before she reacts. If I look at her, smile at her, talk to her in a sing-song voice, and draw her close, she will smile and return to what she was doing because she knows she is safe. If I don’t give her my attention or draw her close, her bottom lip will stick out and she will begin to cry. It is the sweetest thing. This is a very healthy sign of her attachment to me and her understanding that I am a secure base from which she can explore her world (see Bowlby’s attachment theory). I was thinking about this today and saw a definite correlation to what I, as an adult, look to when I am afraid. I will be going about my day, busy exploring my world… and something scary will happen. Government shutdown. A terror attack in a major city. An unexpected expense. Something in one of my kid’s behavior that seems abnormal. And it unsettles me – it makes me anxious. The fear starts to spiral. Until I look into the eyes of my Father. Until I remember that He is in control, that my days are in His hands, and that I have a destiny beyond this world. Then I can calm down, secure in the fact that the God of the universe protects me. Every time I find myself frantic and anxious it is an indicator that I have forgotten to look to my Father. That I have left my primary attachment relationship. When I am making lists and plans, trying to mitigate all the negative circumstances in our lives, feeling alone and abandoned, my fear defines me. But when I check in with Him first and settle my heart with the knowledge that He is FOR ME, suddenly the very real, and very scary things in our world lose their power to define me. I need to fix my eyes. I need to seek His comfort. I need to let His Spirit remind me that I am His, and I have no reason to fear. I need to learn from my little Lucy and look to my Protector.